If you buy plantains green, they will take about a week to start to change colors. It will take another three days to turn yellow-green and another two or three days to change to the final yellow and black. If your local supermarket is anything like mine, there’s a huge display of bananas. And right next to it, there’s a much smaller shelf devoted to plantains. It’s very easy to be in the fruit mind-set, grab a bunch of Chiquitas and be on your way, completely bypassing their relations. That, my friends, is B-A-N-A-N-A-S.
“I think that people don’t really get plantains because they do assume they’re like a banana,” says food writer, radio producer and cookbook author Von Diaz. In fact, plantains have a lot more in common with potatoes than bananas. “All cultures have their starches,” Diaz says, and in Latin America and the Caribbean, plantains are a featured starch. They’re also used for much more than sweets, she says. Plantains are especially versatile because as the outside color changes, so does the flavor, color and texture of the flesh. If you’re tired of your same old bread or potatoes with dinner, it’s time you tried plantains instead. Here’s a quick primer to get you started. Buying and storingGood news: Plantains are about as inexpensive as bananas. 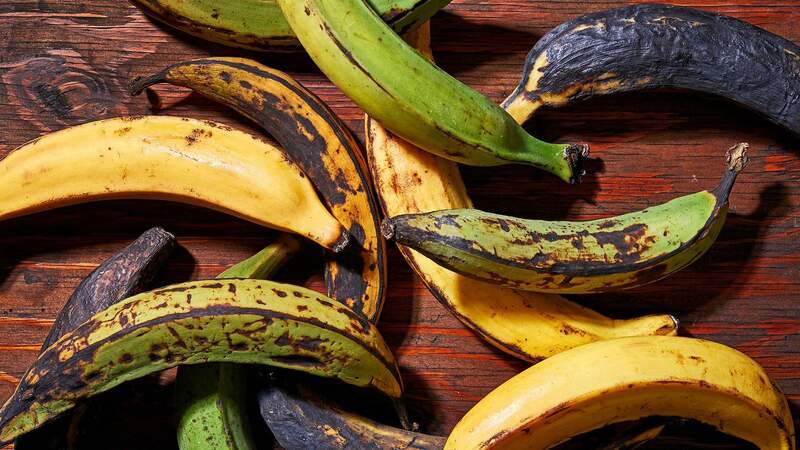 When choosing what to buy at the store, look for green plantains that are solid and full, according to Maricel Presilla’s “Gran Cocina Latina: The Food of Latin America.” The half-ripe will be firm and starting to turn yellow with black spots. Fully ripe are yellow and then black, getting softer and sweeter as they darken. If you buy them green, they will take about a week to start to change colors. It will take another three days to turn yellow-green and another two or three days to change to the final yellow and black. Know the stagesPlantains are harvested when they are green, at which point the flavor is earthy, vegetal and funky, Diaz says. Unlike even an unripe banana, there is no hint of sweetness. Green, or verde, plantains are on the starchy side, too, which makes them ideal for turning into dumplings, thickening soups and frying into chips or twice-frying to turn into tostones, or flattened fritters. At the half-ripe, or pintón, phase, the plantains are still good for boiling or mashing, even as they get softer and sweeter, says Presilla. Yellow (amarillo) and black (maduro) plantains can be used in many sweet or savory preparations, she says. That can include baking, grilling, sauteing and boiling. Keep in mind the general rule that the riper the plantains are, the quicker they will cook. Peel themWhy were my fingers mysteriously black last week? Diaz shed light on the mystery – plantains include a sap that can stain hands, clothes, counters and cutting boards brown or black. So, please dress accordingly before you start working with them. Ripe plantains can be peeled almost the same way as a banana – just cut off the ends first. Green are another matter. “It’s very normal for it to be difficult to get the skin off,” Diaz says. First, cut the ends off with a sharp knife. Then do three slits down the length of the peel, trying not to pierce the flesh (you can even follow the ridges of the skin). Then get under the peel and pry it off, with your fingers, a knife, spoon handle or whatever feels most comfortable and least likely to injure you. Another option that works with some recipes, according to Presilla: Boil the plantains first, for 20 to 40 minutes, depending on the ripeness. Be sure to get all the underside of the skin off, because it can turn bitter in cooking. Cook them“The list is kind of endless” as to what you can make with plantains, Diaz says. As I mentioned above, frying is a common, not to mention delicious, preparation. Fried plantains that are mashed serve as the base of mofongo, a classic Puerto Rican dish that includes fried pork skin and can be topped with a variety of meats and vegetables. Frying in several cups of oil, though, is not necessarily the ideal entry point for those starting to dabble in plantains. Plus, it’s not something I am inclined to do when I want a relatively easy side dish on a weeknight. But pan-fried plantains are certainly an option, cooked in a couple of tablespoons of oil on both sides until they’re browned but not burned. Diaz suggests adding plantains to soups or stews as you would potatoes. You can even include slices of ripe and unripe to get a contrast of flavor and texture. Another low lift: roasting whole in the oven. In her cookbook “Coconuts and Collards: Recipes and Stories from Puerto Rico to the Deep South,” Diaz suggests boiling whole peeled plantains for 20 to 25 minutes before roasting at 350 degrees for the same amount of time after you have cut a slit in the fruit and slid in a tablespoon of butter. Lastly, she broils the plantains with a glaze of dark brown sugar and butter until they darken in color. It may sound like a dessert, but it makes a great savory side, Diaz says. For an even more streamlined dish, you can try the method suggested by Yvonne Ortiz in “A Taste of Puerto Rico”: Cut a 2-inch slit in a whole plantain (peel on), wrap with foil and bake for 40 minutes at 400 degrees. Then peel, drizzle with olive oil and add salt. Further channel the potato similarity by boiling and mashing to serve a puree to which you can add your choice of fat or sweetener. Or follow Diaz’s lead and be inspired by pastelón, a layered Puerto Rican casserole, by swapping in plantains for potatoes in a shepherd’s pie.